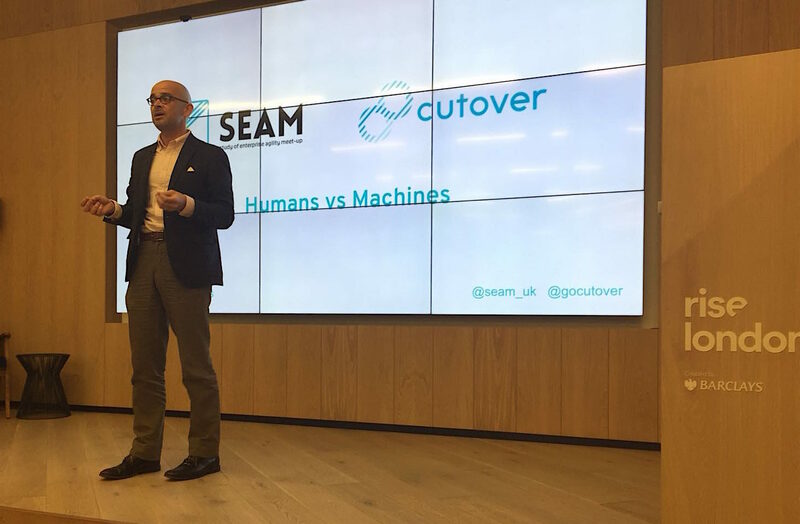 Last night we hosted the 19th monthly SEAM event "Humans vs Machines" at Rise London. It was a great evening filled with interesting talks and debate about the future of humans in an increasingly automated workplace. There was a great turnout and lots of interesting conversations over pizza and a few drinks! After an introduction by SEAM organiser Barry Chandler, Cutover CPO Marcus Wildsmith took to the stage to discuss the role of people in driving major changes in large organisations. 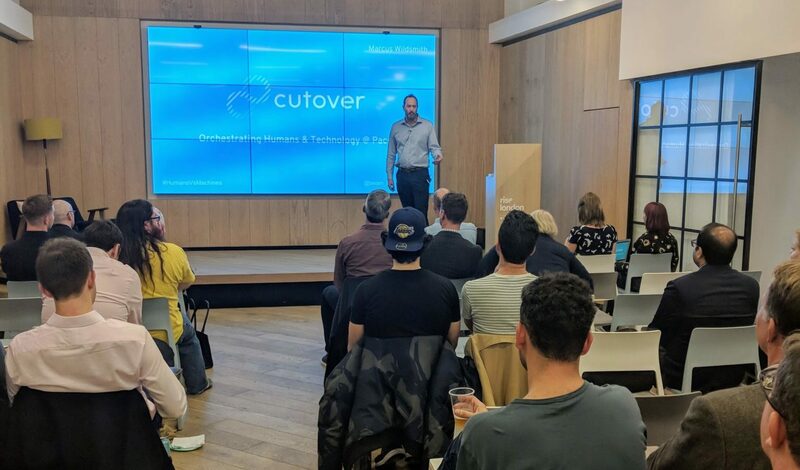 From his experience working for companies such as Ford, EE and now Cutover, Marcus observed that although new technology had transformed many enterprises and industries, this would have been impossible without the great talent and vision of the people behind it. He was then followed by Mark Heywood, who left his role in resilience to become a writer but who still remembers the best thing about working in resilience - the people. Mark recalled his fond memories of “moments of humanity” working in resilience, including the time an engineer received a standing ovation for working 12 hours straight to fix a problem. Mark’s view on the “Humans vs Machines” debate is that people will always come out on top. Ultimately, technology is at its best when it allows people to connect to each other, and Mark cited apps such as AirBnB that remove everything operational or logistical and simply connect people directly to each other. The point of new technology should be to make people’s lives and jobs easier by removing the mundane and operational. 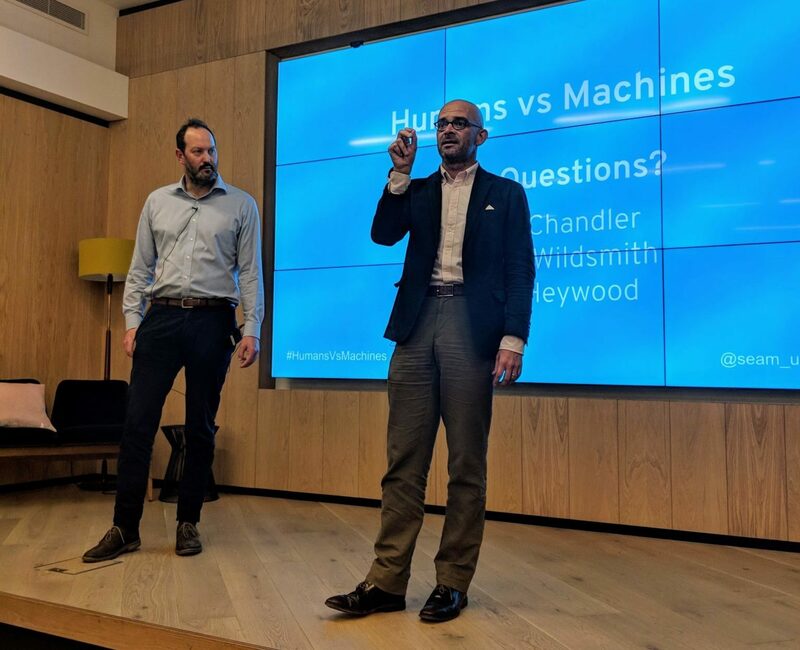 We also had some interesting questions from attendees which led to some great discussions about the relationships between people and machines. Ultimately, we see the most likely outcome, and the best, to be a world where new innovations augment and empower people, not where they take humanity out of the equation altogether. 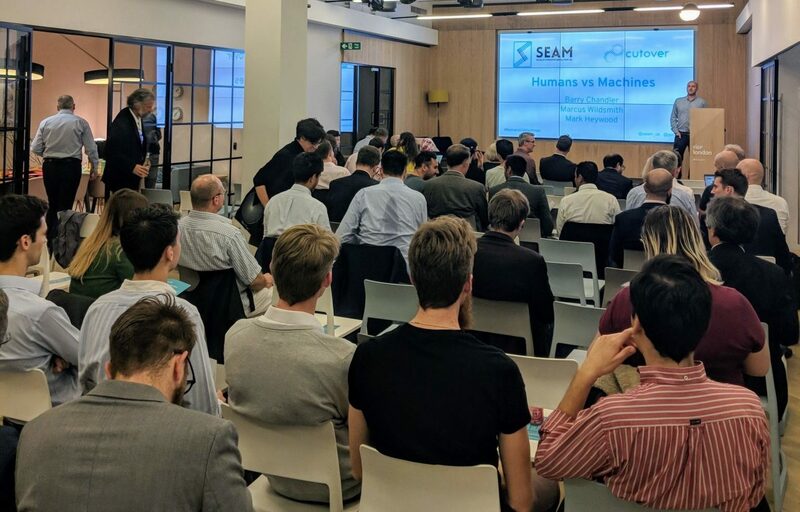 A big thank you to Barry Chandler for allowing us to host this month’s SEAM event, Mark Heywood for such an interesting take on the humans vs machines question, and everyone who attended and participated in the great discussions around the topic. We hope to see some of you again at the upcoming SEACON on November 12th at HereEast Innovation Centre, where our CEO Ky Nichol will be presenting. Don’t forget to pop by our booth and say hello if you’re there! If you haven’t already, you can register to attend SEACON here.